﻿ To Build a Better Bus Lane, Just Paint It | Los Angeles Flow Project L.A.
Take it from Everett, Massachusetts, which borders Boston but lacks a rail transit connection. A study of Everett’s transportation gaps identified an opportunity to ramp up bus frequency down Broadway, a major artery, and Everett’s mayor urged local planners to seize it. Compared to other suggestions in the study, like building rail or BRT, installing a bus lane would be relatively cheap and easy. First, planners had to figure out how many extra buses could run down the street during rush hour if they had their own lane.Corridors with “red carpets” for buses saw 24 percent fewer crashes. Other cities that have adopted TTLs on a wider scale have seen more impressive results. 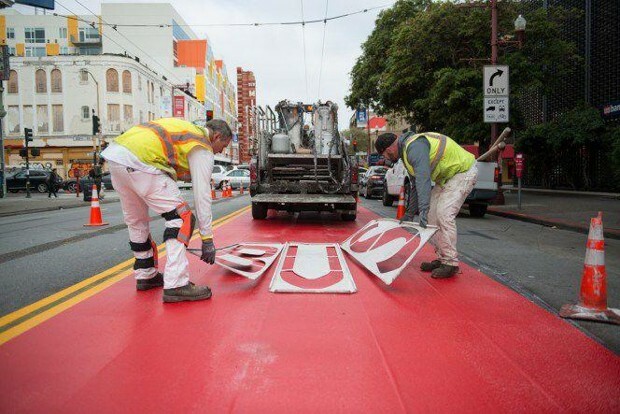 In San Francisco, a before-and-after study foundthat three bus lanes painted onto downtown streets in 2014 improved transit delays (despite increases in car traffic), boosted transit reliability by 25 percent, and cut collisions by 16 percent. Even better, the bus lane might have saved lives: Corridors with “red carpets” for buses saw 24 percent fewer crashes that resulted in injury, compared to citywide rates that hardly budged.